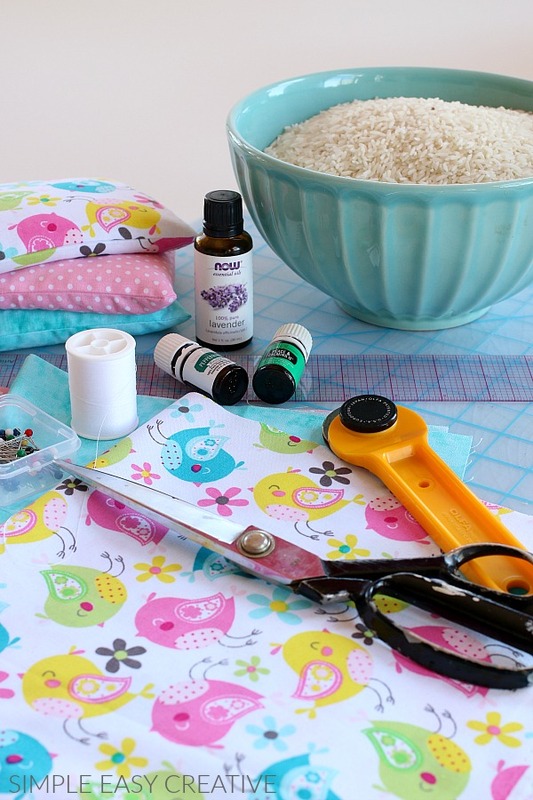 These Homemade Heat Packs are easy to make, with just a few supplies, are inexpensive and make great gifts too! What should I use the rice heat pack for? The homemade heat packs can be used for sore muscles, when someone is not feeling well or even to warm up on a cold night. You can add Essential Oils like lavender or peppermint to the rice before filling the heat pack, which not only makes them smell good, but also helps to calm (lavender) and helps with colds and breathing when you are sick (peppermint). Who should use the heat packs? 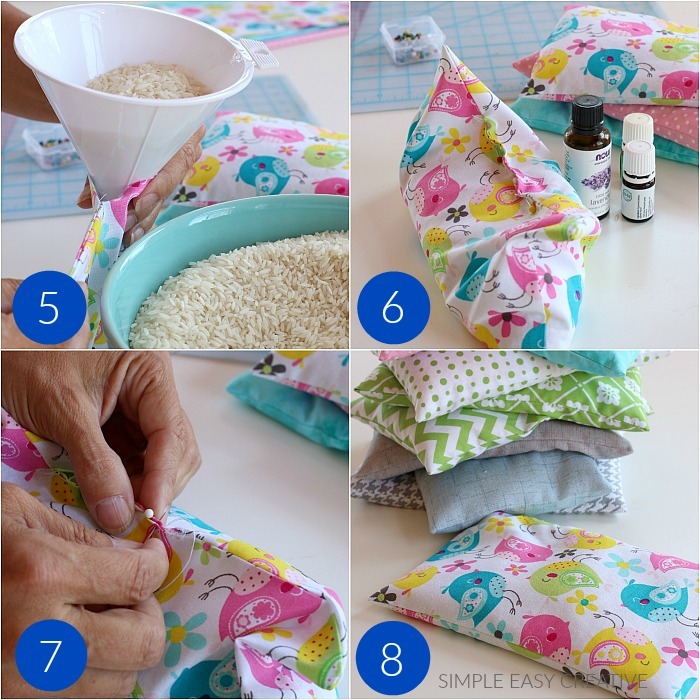 Making your own heat packs with rice makes them very user friendly for any age. The concern with an electric heating pad is they are not recommended for everyone. The heat packs are great for athletes, people who workout, gardeners – really anyone can use the reusable heat packs. 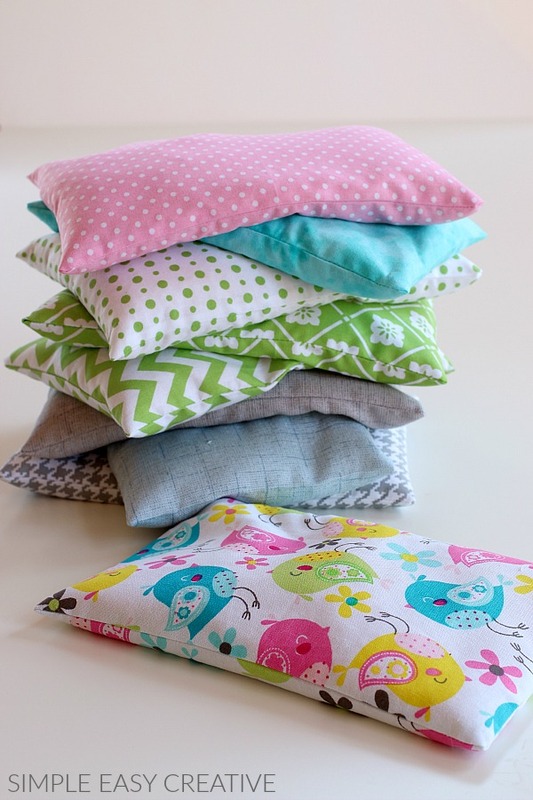 How should you use the homemade heat packs? 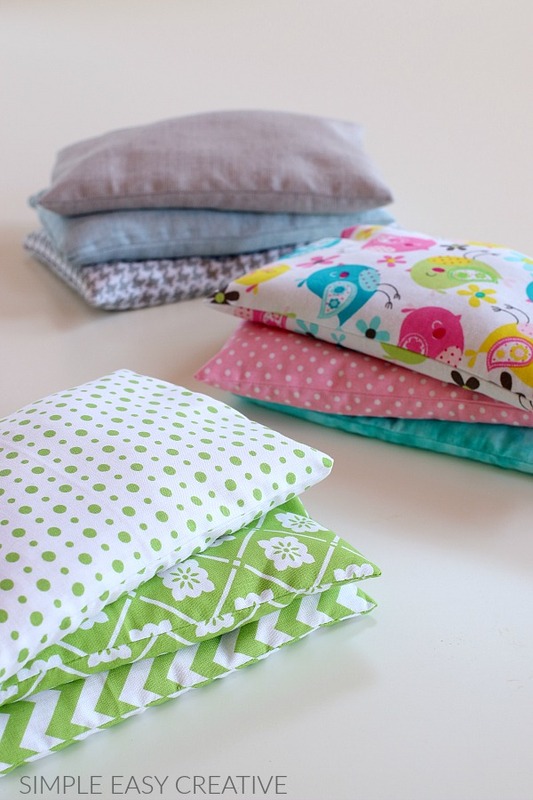 These DIY Heat Packs are made for the microwave. Heat for 1-2 minutes, shake gently and apply to area that is needed. You can also place the pack in the freezer and use as a cold compress. What should I use to fill the homemade heat packs? Long-grain rice is the preferred filler, be sure it’s NOT instant rice. However, you can also use other grains like beans, corn, wheat, barley, or millet. Dried Cherry Pits have also been used as filler. 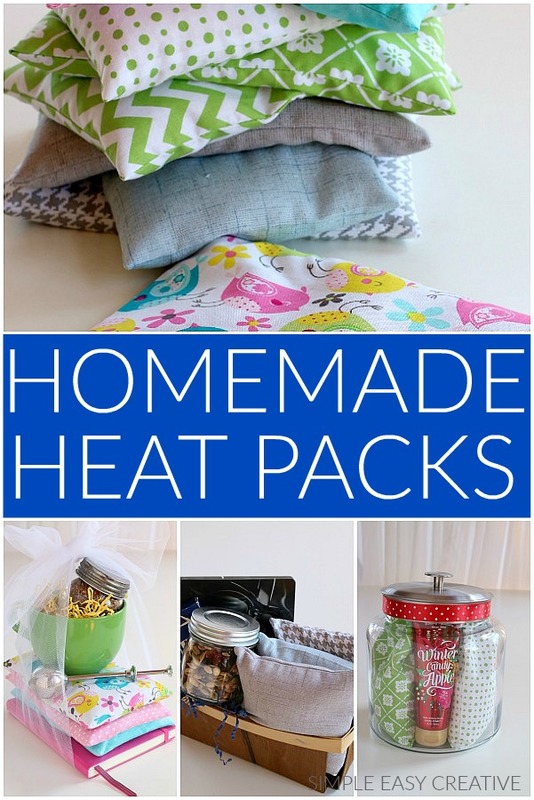 What should I use to make the homemade heat pack? Cotton fabric is best to use. It can be found at any fabric or craft store, and some discount stores like Walmart. 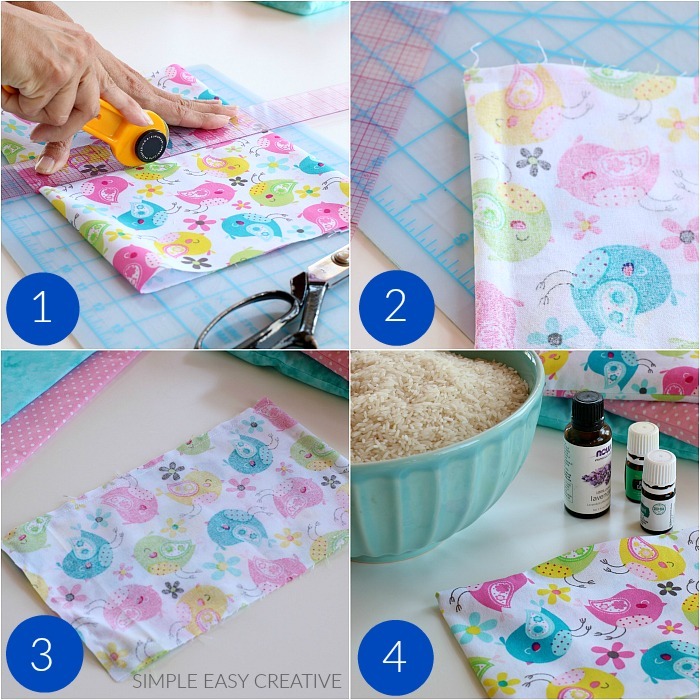 You can also make the heat packs using white muslin and then make a sleeve that the heat pack slides into – making the heat pack easier to clean. What size should the heat packs be? Any size will work. The ones I made are 5 inches x 8 inches after they are filled. Rectangle size works great for wrapping around your neck or knee. 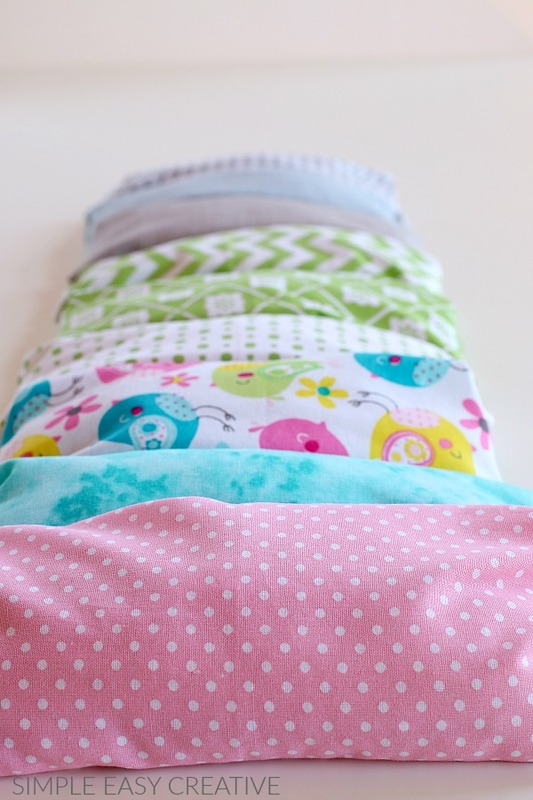 Fabric – cotton works best – the fabric I used were fat quarters that I purchased at Walmart. Any fabric or craft store should have or any fabric by the yard works fine too. I found that it was super easy to cut the fat quarters since they were already the length I wanted. I got 3 heat packs from 1 fat quarter. Long Grain Rice – be sure it’s not instant. You can also use other grains for the filling like beans, corn, wheat, barley, millet. Cherry Pits are also another alternative for filling. Essential Oils – this is optional, but I like them. Using lavender essential oil gives a calming feeling and using peppermint is good for when you have a cold. Cut fabric. Any size will work. Determine your finished size, then double the LENGTH and add 1/2 – 1 inch for seam allowance. These are cut – 6 inches by 18 inches – making the finished heat pack 5 x 8 after sewn and filled. A cutting mat and rotary cutter works great, but you can also use a ruler and scissors. Use a funnel to fill with rice. Fill about 3/4 full. For this size of heat pack, I used 1 (3) pound bag of long grain rice for 3 heat packs. I found it easiest to sew several heat packs at once, repeating the steps for each heat pack at once. So – cut all the fabric, then sew, turn, iron, fill, stitch closed. Giving the Homemade Heat Packs in gifts is a great idea! You can add lotions, games, movies, snacks and more to a gift basket along with the heat packs. Having a few reusable heat packs ready, you can easily put them together with some chicken soup, crackers and other items for a friend or family member when they are not feeling well. When you make these Homemade Heat Packs or any of my other recipes or projects – I’d love to hear what you thought, leave a comment below in the comment section or tag me on Instagram with #simpleeasycreative so I can see them! What a great idea Janeen! I love that! I remember having some hot hands for cold baseball games, and loved them! Did you put directions on the tag if giving them for a gift? Hi Stephanie, yes I think that is a great idea! about how much rice did you put inside and and many drops of essential oil? Hi Donna, the amount of rice will depend on how large the bag is. These bags are about 6 x 9 inches and we added enough rice to fill them 2/3 full. The easiest way to tell if you need more or less rice is to fill them and then lay them out, if they seem too full remove some rice or if they are too flat then add rice. I added the essential oil to the rice before filling. 3-4 drops is plenty. I know I’m probably being dense, but what are fat quarters? Also I’ve had these before, but never made them. Mine were made using soft flannel. I really like the idea of using muslin on the inside and then making a slightly larger cover that can be washed. Thanks for the great directions and ideas. Hi DeeAnne, FatQuarters are a fold of material. They are basically pre-packaged fabric that is cut and wrapped, ready for you to purchase, you don’t need to ask for fabric to be cut. I bought mine at Walmart, but you can also find them at Hobby Lobby and any fabric store. These are so helpful and make the perfect gifts! Thanks Kristyn! I love giving the heat packs for gifts! Everyone always appreciates them! Great idea! These are so cute too! What a fabulous idea! Definitely must try this! Thanks Erin! Our heat packs get used a lot! Good idea! I love all the different fabrics! Thanks Jaide! I had fun picking out the fabric and making the heat packs! These are so amazing for sore muscles and achy joints! I agree Tara! They come in so handy! Liz, seriously?! This is the coolest thing of all time! I have big time lower back problems and I am always alternating ice packs with a heating blanket but it is such a hassle because there is no plug close to my bed. What an awesome idea, totally going to ask a family member to make some of these for me! Thrilled you like them Billy! They are fabulous for back problems! I visited the Chiropractor twice a month, so my heat packs definitely get used a lot. Oh, that’s a great idea! Stocking stuffers can get so expensive!